Out in Reel Film Series begins April 10! 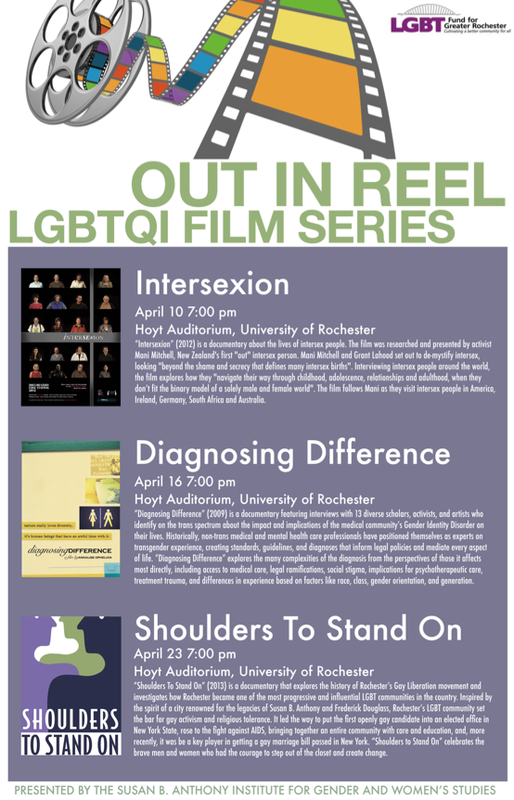 We will kick off the Out in Reel LGBTQI Film Series with a screening of Intersexion on Thursday April 10 at 7pm in Hoyt Auditorium. We will continue Out in Reel next Wednesday with Diagnosing Difference, and the following Wednesday with Shoulders to Stand On. The Shoulders to Stand On screening will feature a panel organized by the University of Rochester’s Pride Network. More details will be available soon. For film and screening details please see the poster below. The Out in Reel series is one of many LGBTQI Awareness Month events. For a complete listing of LGBTQI Awareness Month events at the University of Rochester please see our “April is LGBTQI Awareness Month!” post.